The subject of stability and control of an airplane has throughout the previous chapters been kept in the background so as not to complicate the study of the forces acting on an airplane and the related performance considerations. It remains now to consider this subject in view of the presented material. Simply defined, stability is the tendency, or lack of it, of an airplane to fly a prescribed flight condition. Control is the ability of a pilot to change the airplane's flight conditions. The subject of stability is considered first. For an airplane to be in equilibrium for a particular flight condition, the sum of all the forces and moments on it must be zero. For example, consider an airplane flying straight and level as in figure 129(a). Then the lift equals the weight, the thrust equals the drag, and there are no net rotating moments acting on it. It is in equilibrium. Now, if the airplane is disturbed, for example, by atmospheric turbulence, and noses up slightly (angle of attack increases), the airplane is no longer in equilibrium. If the new forces and moments, caused by the angle-of-attack increase, produce a tendency to nose up still further, the airplane is statically unstable and its motion will diverge from equilibrium. (See fig. 129(b).) If the initial tendency of the airplane is to hold the disturbed position, the airplane has neutral static stability. (See fig. 129(c).) On the other hand, if restoring forces and moments are generated by the airplane that tend initially to bring it back to its equilibrium straight and level condition, it is statically stable. If it is assumed that the airplane is statically stable, it may undergo three forms of motion with time. It may nose down, overshoot, noseup, overshoot to a smaller degree, and eventually return to its former equilibrium condition of straight and level flight. (See fig. 130(a).) This type of decaying oscillatory motion indicates that the airplane is dynamically stable. Or it may continue to nose up and down thereafter at a constant amplitude. The airplane is said to have neutral dynamic stability (fig. 130(b)) or, in the worst case, it may nose up and down with increasing magnitude and be dynamically unstable (fig. 130(c)). An airplane may be dynamically unstable and still be flyable if the pilot uses control by working the elevators in this last instance. But, ideally, he should not need to do this. An airplane of this design has poor flying qualities. An airplane which is statically and dynamically stable can be flown "hands off" by a pilot with no control necessary except to change the equilibrium flight condition. (a) Statically and dynamically stable. (b) Statically stable; neutral dynamic stability. (c) Statically stable; dynamically unstable. Longitudinal stability and control is concerned with an airplane's pitching motion, lateral stability and control relates to an airplane's rolling motion, and directional stability and control relates to an airplane's yawing motion. Lateral and directional stability are closely interrelated and, therefore, the two are sometimes simply referred to as lateral stability. Longitudinal stability.- Since longitudinal stability can be considered independent of lateral and directional stability, it is discussed first. Consider an airplane "trimmed" to fly at some angle of attack, atrim [Greek letter alpha]. This statement says that the airplane is in equilibrium and there are no moments tending to pitch the airplane about its center of gravity. Figure 131(a) shows how pitch equilibrium is achieved for an airplane. The forces acting are the weight through the center of gravity, the lift and drag at the aerodynamic center, and the thrust along the thrust line. The aerodynamic center of the airplane usually is very close to the aerodynamic center of the wing alone. In this example it lies in back of and above the center of gravity. The thrust line may lie above or below the center of gravity; in this case, above. The moments about the center of gravity are the forces times the distance between them and the center of gravity. It is seen in this case that the lift and thrust both contribute nose-down moments whereas the drag contributes a nose-up moment. If these do not cancel each other out, the airplane will not be in equilibrium. It is evident that another moment source is needed-the horizontal tail. The horizontal tail acts as a small wing and the pilot can achieve lift or negative lift by elevator control. Because of the long moment arm from the center of gravity to the aerodynamic center of the horizontal tail, only relatively small forces are needed. Thus, the horizontal tail supplies the balancing moment as shown in figure 131(b). To fly in a particular equilibrium condition, the elevator is "trimmed" to a particular angle. The total moment about the airplane center of gravity is zero. If the airplane is statically stable in a longitudinal sense, then if disturbed away from the trim angle of attack, moments are generated that tend to return the airplane to the equilibrium atrim [Greek letter alpha]. It is customary to express the moment nondimensionally as a coefficient of moment about the center of gravity, or (Cm)cg. (See eq. (27).) Figure 132 shows the longitudinal statically stable case of the moments plotted against the angle of attack. Of course, there is no moment at the trim angle of attack; negative moments rotate the nose down for angles of attack above atrim [Greek letter alpha], and positive moments rotate the nose up for angles below atrim [Greek letter alpha]. (a) Net moment pitches airplane down. Figure 132.- Longitudinal static stability moments as a function of angle of attack. Figure 133.- Longitudinal static stability components. Figure 134.- Stable, neutral, and unstable static stability. ...additional factors which reduce the usable center-of-gravity range. These include engine-on thrust effects and ground effects (including landing gear, flaps, and other considerations) as shown in figure 135(b). To insure that the actual center of gravity of the airplane falls within the usable range, an airplane is carefully designed and loaded. For example, there are cases of transport airplanes crashing because the airplane was loaded or the cargo shifted in flight so that the center of gravity fell outside the range of usable limits. The airplane then became unstable. The location of the center of gravity is an important factor in a stable airplane. Figure 135.- Usable center-of-gravity range. ...considerable importance. Figure 136(a) shows how the air is deflected downward when it leaves a wing. This deflection of air results in the wing reaction force or lift. This deflected air flows rearward and hits the horizontal-tail plane. If the airplane is disturbed, it will change its angle of attack and the downwash angle also changes. The degree to which it changes directly affects the tail effectiveness. Hence, it will reduce the stability of the airplane. For this reason, the horizontal tail is often located in a vertical location such that it is exposed to as little downwash as possible, as shown in figure 136(b). Figure 136.- Downwash effects on tail. ...flight condition after being disturbed. The first form is the phugoid mode of oscillation which is a long period, slow oscillation of the airplane's flight path. (See fig. 137(a).) Often, it is poorly damped and can be an annoyance. The pilot generally can control this oscillation himself although the more highly damped it is, the greater the drag is. The second oscillation is a short- period variation of the angle of attack as shown in figure 137(b). Usually, this oscillation damps out very quickly with no pilot effort. However, with its natural short period, the oscillation may worsen if a pilot attempts to damp it out by use of a control because of the pilot's slow reaction time where he may get "out of phase" with the oscillation, and thus, induce dynamical instability that may eventually lead to destructive forces. A second type of short term oscillation occurs if the elevators are left free. This is called the "porpoising" mode, and is influenced by the elevator balance. The main effect is vertical accelerations of the airplane that may get out of hand if a coupling between the free elevator and airplane occur. Proper design is essential here. Insofar as compressibility effects are concerned, the rearward movement of the aerodynamic center of the wing as the airplane goes supersonic is most evident. This condition increases the static stability to such an extent that the airplane may "tuck under" and be extremely stable in a steep dive. Figure 137.- Two types of dynamic longitudinal oscillations. This condition has been discussed previously with regard to the SST. One answer to this problem is to move the center of gravity rearward by a transfer of fuel as the airplane goes supersonic. Other solutions include the double-delta wing configuration or canards placed at the nose of the airplane to develop an additional nose-up moment due to lift in the transonic and supersonic range. This arrangement has an added advantage of contributing to the airplane lift. The use of a canard for trim and a rear sailplane for control is beneficial. The canard would trim the rearward shift of the aerodynamic center at supersonic speeds, and the strong nose-down moments from high lift devices (flaps) at low speeds by providing uplift. When not used, the canard can be allowed to trail in the free stream at zero lift and also generate minimum drag. Figure 138 shows the North American XB-70. It has a pair of canards for stability at supersonic speeds to prevent "tuck under." Additionally, the wing tips are turned downward to keep the aerodynamic center forward. Directional stability.- Many of the basic ideas involving longitudinal stability also apply to directional stability. In the usual equilibrium condition, an airplane flies so that the yaw angle is zero as shown in figure 139(a). To have static directional stability, a positive yawing moment should be generated if the airplane is disturbed to a negative yaw angle or alternatively by convention, a positive sideslip angle ß and a negative yawing moment generated for a negative sideslip angle excursion. The previous condition is shown in figure 139(b). If the airplane holds its disturbed position, it has neutral directional stability. If the tendency is to increase the disturbed position, further away from equilibrium, the airplane is directionally unstable. Figure 140 shows the variation of yawing-moment coefficient with sideslip angle. Here, one observes a positively sloping line as a directionally stable case. Figure 139.- Static directional stability. Figure 140.- Directional stability curve. The fuselage and the vertical tail are the two most influential components in directional stability. As figure 141 shows, when an airplane is in a disturbed condition at a sideslip angle ß , in general the fuselage alone will generate a moment that tends to increase the disturbance; that is, it is unstable. The vertical tail is the main component of static directional stability. When placed at an angle of attack due to the sideslip disturbance, it generates a side force which when multiplied by the moment arm (center of gravity of airplane to aerodynamic center of vertical tail) produces a stabilizing moment that tends to move the airplane back to a zero sideslip or yaw condition. The size of the vertical tail is dependent on many factors that cannot be adequately covered here. Some observations are useful, however. The vertical tail usually has a low aspect ratio to prevent stalling. If a stall should occur, instability results and a catastrophic sideslip divergence may result. Adding more vertical tail by use of a dorsal fin extension or ventral tail area provides a stable yawing moment at large sideslip angles. 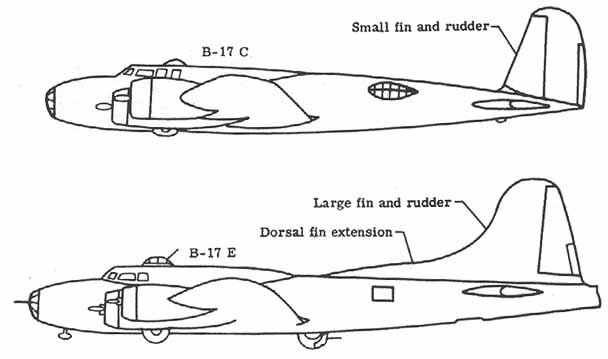 Figure 142 shows a B-17 bomber before and after addition of a dorsal fin extension. A tractor propeller of a typical airplane is a destabilizing influence on the directional stability, and it also imparts a rotational velocity to the slipstream. As shown in figure 143 it produces a sidewash angle at the tail that reduces the static stability effectiveness of the tail. This effect can be very pronounced in aircraft with large engines. 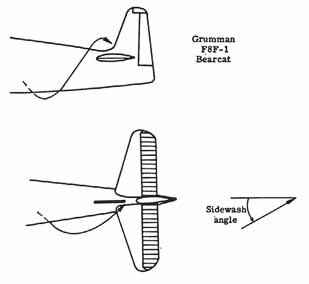 The Grumman F8F Bearcat, a carrier plane, would require a certain degree of rudder offset by the pilot to counteract the yaw induced by the sidewash during high powered take-offs. Contrarotating propellers are a solution to this problem. The wing's degree of sweep influences the yawing moments. A sweptback wing will add to the directional stability whereas, a sweptforward wing will detract from the total directional stability since it is by itself a destabilizing influence. This is a contributing reason for choosing sweptback wings over sweptforward wings. Lateral stability.- An airplane is said to possess lateral static stability if after undergoing a disturbance that rolls it to some bank angle ø [Greek letter theta], it generates forces and moments that tend to reduce the bank angle and restore the equilibrium flight condition. Figure 141.- Directional stability moments. Figure 142.- Improving directional stability. Figure 143.- Slipstream effect at tail. Figure 144.- Dihedral effect on lateral stability. ...the relative free-stream direction is now in a direction toward which the airplane is sideslipping. If the airplane is laterally stable, moments arise that tend to reduce the bank angle. From geometric considerations, when wings have dihedral, the wing closer to the sideslip (that is, toward the free- stream velocity), hence the lower wing, will experience a greater angle of attack than the raised wing and hence greater lift. There results a net force and moment tending to reduce the bank angle as shown in figure 144(c). Figure 145.- Effect of wing placement on lateral stability. ...low wing placement has a destabilizing effect in roll. However, this effect may be counteracted by including more dihedral to improve the overall lateral stability. Wing sweep will help promote lateral stability as figure 146 shows. When a swept-wing airplane is sideslipping, the wing toward the sideslip will experience a higher velocity normal to the wing's leading edge than the wing away from the sideslip. More lift is generated on the wing toward the sideslip and a roll moment arises that tends to diminish the bank angle and return the airplane to equilibrium. It may be noted that the combination of dihedral and sweep may produce too much lateral stability and some airplanes will use a small amount of anhedral (wings turned down slightly) to lessen the lateral stability. The effects of the fuselage and vertical tail may contribute to or detract from the airplane lateral stability. In a sideslip, there will be a side force caused by the area presented by the fuselage and vertical tail. If the side force acts above the center of gravity, as shown in figure 147, there is a roll moment generated that tends to diminish the bank angle. If the side force is below the center of gravity, there is a destabilizing moment set up that will further increase the bank angle. Destabilizing moments that also tend to increase the bank angle of an airplane in a sideslip arise because of the direction of the slipstream for a propeller-driven airplane and the use of partial span flaps. Added dihedral or sweep again may be used to decrease these detrimental effects. Figure 146.- Wing sweep aids lateral stability. Cross effects and dynamic effects.- As mentioned earlier, lateral and directional stability are interrelated. Briefly stated, the motions of an airplane are such that a roll motion causes a yaw motion and a yaw motion causes a roll motion. Thus, cross-coupling exists between the directional static stability and lateral static stability and gives rise to the three important dynamic motions observed: directional divergence, spiral divergence, and Dutch roll. Figure 147.- Effects of fuselage and tail on lateral stability. Dutch roll is a motion exhibiting characteristics of both directional divergence and spiral divergence. The lateral stability is strong, whereas the directional stability is weak. If a sideslip disturbance occurs, as the airplane yaws in one direction, the airplane rolls away in a countermotion. The airplane wags its tail from side to side. Figure 149(a) illustrates this effect. Ventral fins, although primarily used to augment the vertical fin which may be in the wake of the wing at high angles of attack, are also beneficial in decreasing the lateral stability and increasing the directional stability to reduce the effects of Dutch roll. Figure 148.- Directional and spiral divergence. Control, whether an airplane is stable or unstable, is the ability of a pilot to change the airplane's flight conditions. It is brought about by the use of devices that alter the lift force on the surface to which they are attached. The familiar controls are shown in figure 15. They include the elevator to provide longitudinal control (in pitch), the ailerons to provide lateral control (in roll), and the rudder to provide directional control (in yaw). Some other control devices are discussed later. ...(fig. 151(a)). This movement gives a negative camber to the entire horizontal-tail surface and a downward lift is produced. This, in turn, produces a nose-up moment about the airplane center of gravity and the airplane pitches upwards. A side motion of the control stick results in the movement of one aileron up and the other down as shown in figure 151(b). This reduces the camber of one wing while it increases the camber of the other wing. One wing then produces more lift than the other and a rolling moment results. This condition causes the airplane to roll about its longitudinal axis in the direction toward which the control stick was pushed. Figure 150.- Basic control system. ...right. As shown in figure 151(c), this movement increases the vertical tail camber and a tail force to the left results. A moment arises that yaws the nose to the right and hence, the airplane turns right. Figure 151.- Control surface operations. Balanced controls.- Whenever a pilot deflects a control surface into the fluid flow, a pressure distribution will be set up that tends to force the control surface back to its original position. The force necessary to hold a particular control surface deflection may or may not be small depending upon the control surface design. Not only must the pilot be able to deflect the surface at will, but the forces should be small enough to insure that the pilot does not tire. Balance is used to reduce the deflection forces required. In figure 153(a) two forms of aerodynamic balance are shown. The hinge of the surface is set so that when the surface is deflected, the air that strikes the surface forward of the hinge creates a pressure distribution, hence force, that helps turn the surface even further. This counteracts the force aft of the control surface tending to reduce the control surface deflection. By careful design, the pilot-supplied effort is considerably reduced. However, care must be exercised so that the controls are not "too light" (little effort needed to move them) lest the pilot unwittingly overcontrol the airplane to its destruction. The control systems of today's airplanes are power-operated and, whether aerodynamic balance is used or not, the pilot-felt control forces are small. In fact, artificial feel is incorporated into the controls so that the pilot has a sense of feel in the controls. Figure 153.- Aerodynamic and mass balance. ...instability of the airplane. The solution is to move the control surface center of gravity near or forward of the hinge line. This may be accomplished by adding lead forward of the hinge line or as shown in figure 153(b), by using small mass balances. Tabs.- Tabs are auxiliary control surfaces placed at the trailing edges of the primary control surfaces. Tabs serve two purposes: (1) to balance and (2) to trim. As shown in figure 154(a), balance tabs are set up to move opposite and proportional to the primary control surface movement. They are used to assist the pilot in moving the control surface and in reducing stick forces. If the pilot wishes, for example, to move the elevator down, the balance tab will deflect upward as the elevator deflects downward and the pressure distribution set up will create a force, hence moment, to move the control surface down. Because they are placed at the trailing edge, balance tabs possess long moment arms and are very powerful in action. Figure 154.- Balance and trim tabs. ....surface with the trim tab set to reduce moments about the hinge line to zero. The airplane will continue to fly in this condition and no pilot effort is required to hold the control surface deflection. When a new control deflection is needed, the trim tab must be readjusted for the new setting (if adjustable). Other control devices.- Some control devices do not fall into the conventional categories outlined above. They are used in unusual flight circumstances or for added control advantages. Included are spoilers, all-moving surfaces, reaction controls, and the butterfly tail. Spoilers, previously discussed with respect to subsonic flow, are used to reduce or "dump" the lift on a wing by altering the pressure distribution. They are useful on gliders to vary the lift- drag ratio for altitude control and on airliners on landing to reduce lift quickly to prevent the airplane from bouncing into the air. But, they are  also useful in lateral (roll) control. At low speeds, ailerons are the primary lateral control devices. At high speeds, however, they may cause bending moments on the wing that distort the wing structure. At transonic speeds compressibility effects may limit their effectiveness. Spoilers may be used to avoid these disadvantages. As shown in figure 155 by reducing the lift on one wing, the spoiler will cause a net rolling moment to roll the airplane about its longitudinal axis. Control effectiveness may be increased by increasing the chord length of the control surface relative to the entire surface to which it is fitted. The limiting case is the all-moving control surface. Whereas the conventional control surface changed lift by a change in camber, the all-moving control surface controls lift by angle-of-attack variations. Examples are to be seen on the horizontal- tail surfaces of the F-4 Phantom and the F-14A airplanes (fig. 156). By being able to change its angle of attack, the all-moving surfaces can remain out of a stalled condition. The conventional control surfaces are considerably less effective at high speeds where compressibility effects are dominant. The all-moving horizontal tails may be moved independently as well to provide lateral control. At low dynamic pressures aerodynamic control surfaces become largely ineffective because only small forces and moments are present. Under these conditions, reaction control devices may be used. These are small rockets placed at the extremities of the aircraft to produce the required moments necessary to turn the airplane about each of its axes. At zero or low speeds, the Hawker Harrier VTOL airplane uses reaction rockets placed in the nose, wing tips, and tail as shown in figure 157. Figure 155.- Lateral control with spoilers. Figure 156.- Examples of all-moving surfaces. Figure 157.- Hawker Harrier reaction control system. The North American X-15 rocket plane used reaction controls when it flew at altitudes of such low air density that the aerodynamic surfaces were useless (fig. 158(a)). In the same manner, the Space Shuttle will use reaction controls (fig. 158(b)) for the same reason to change its pitch, yaw, and roll attitudes. The butterfly tail (fig. 159(a)) is an interesting variation of the conventional control system since it combines the functions of the vertical and horizontal tail. The advantages claimed are reduced weight and drag. However, there are increased problems in cross-coupling of the pitch, yaw, and roll motions and reduced directional dynamic stability. To pitch up or down, both control surfaces are moved up or down  together (fig. 159(b)). To yaw right or left the "ruddervators" as they are called are moved in opposite directions through equal deflections as shown in figure 159(c). This brief introduction to stability and control has shown many factors that influence the design of an airplane. It must be stressed that the final design is at best a compromise to often conflicting parameters. As one moves towards multimissioned airplanes, the compromises become more frequent. Cost and competition are the final arbiters of design. (b) Space Shuttle reaction controls. Figure 159.- Butterfly tail operation.